Do you often invite family members over for casual get-togethers, friends for semi-formal dinners, or important clients to conduct off-site business? If so, you can make a lasting impression with custom concrete furniture. Why have an ordinary house when you can live in a gorgeous home complete with furniture pieces seldom seen? Like most people, you probably think of custom concrete furniture as being hard, cold, and uncomfortable. However, nothing could be further from the truth. When you purchase items from a reputable business, one known for its forward-thinking creations, you end up with comfortable furniture that looks amazing. Let us say you do a lot of entertaining in your hearth room. Along with a gorgeous fireplace, you can leave your guests speechless by incorporating a coffee table and matching end tables with a design that mimics the flow of lava, complete with stunning backlighting in a bright blue, red, or any color you choose. 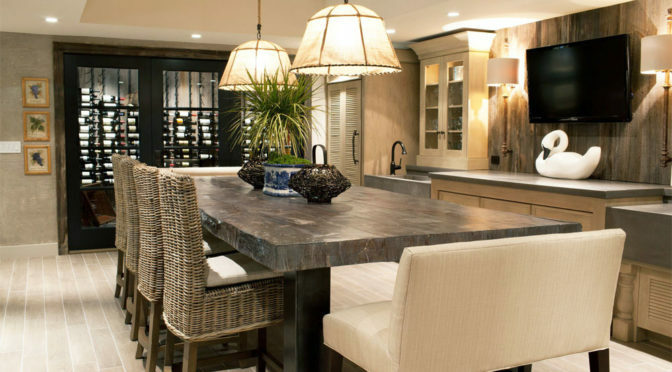 For a meal around the dining table, create a memorable occasion for family and friends using custom concrete furniture. With a table and chairs designed to look like expensive handcrafted wood, no one will know the difference. What makes the concrete so appealing is you never have to worry about hot plates, dropped glasses, or spilled wine causing permanent damage. Why not make your entryway or foyer stand out with custom concrete furniture? Whether you opt for a beautiful console or sideboard, it will amaze everyone. For a formal or contemporary home, have a table made with minimal design elements in all white. However, for a beachside or country style home, consider a table with sweeping curves in a mahogany or cherry wood tone. How about a glass-covered bar with legs that look like genuine tree trunks? The sky is the limit with custom concrete furniture. When working with a talented company, an expert will see your wants and needs, and offer suggestions on furniture pieces that surpass your expectations.